When you see a doctor about a spine-related problem, you’ll likely undergo a thorough physical examination and be asked to describe your symptoms and give some details about your history with back and/or neck pain. With some issues, such as a neck sprain or muscle spasms in the lower back, this may be enough to make a diagnosis. However, there are times when image testing has to be done to get a better view of what’s going on with the spine. Here’s a closer look at three common spine imaging tests and what conditions they can accurately diagnose. An X-ray is a standard image test. It’s also the least expensive of the three options discussed here. X-rays provide clear images of the spinal bones, including vertebrae and joints. They can also give a doctor an idea of the integrity (e.g., strength, health, and shape) of spinal bones. Because X-rays don’t provide clear images of soft tissues, a magnetic resonance imaging (MRI) scan may be recommended for problems related to non-bone tissues in or around the spine. An MRI works by using a combination of radio waves and a magnetic field to produce a detailed image of the spine. Unlike X-rays, MRIs don’t produce or use radiation. A computed tomography (CT) scan combines the use of X-rays with a computer to produce clear images of bones, tissues, and organs. Radiation is produced with a CT scan. However, it doesn’t stay in the body after the scan is completed. While image tests can provide some useful information or confirm a suspected problem, an accurate diagnosis is also based on a solid understanding of how symptoms are directly affecting you. To help you provide a better description of what you’re experiencing, you may be asked to keep a journal for a brief time so you can make note of what seems to trigger your discomfort along with when your pain is worse and what seems to make your symptoms less distracting. 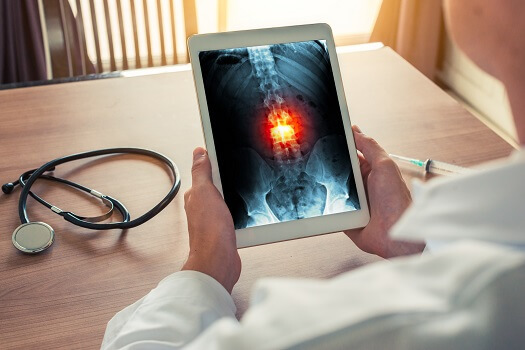 Imaging tests can be very effective at diagnosing a wide range of spine-related issues, and they often help doctors make final decisions about recommended treatment, which may eventually include a surgical procedure such as extreme lateral interbody fusion. Santa Monica residents who are experiencing severe or prolonged pain in the back or neck should contact the spine specialists at The Spine Institute. Our cutting-edge treatment methods and pioneering physicians lead the spinal health industry, and we have decades of experience with every aspect of back pain and how to alleviate it. To schedule a consultation, call one of our friendly representatives today at 310-828-7757.